Urban Adonia: Bike Co-ops for Some, Bike Shops for Others? Bike Co-ops for Some, Bike Shops for Others? After dinner on a recent night, I stepped out to unlock my bike and found that my front tire was flat. I knew this was coming, I'd had a slow leak for a few weeks and had been pumping the tire every time I rode the bike. (This is like fingernails on a chalkboard for bike mechanics, I'm sure). I have a patch kit, I have tire levers, multiple people have taught me to repair flats, and I have successfully accomplished this with supervision in the past. But I knew that taking on this task was going to mean some frustration and fiddling around, so I just kept putting it off until I found myself without my bike tools and on my way somewhere with friends. I'm in Portland right now, so of course I was standing across the street from one bike shop and around the corner from another. We walked our bikes over to River City and I handed off my bike to a mechanic. I felt like apologizing for needing someone else to take care of the flat for me. Was the mechanic I paid to fix my flat judging me? I wandered around the store feeling ashamed. There's definitely a lot of wisdom in the idea that if I knew how to fix small problems with my bike, I'd be less reliant on others for help in a pinch. But how silly is it to want to apologize to a bike mechanic for buying a service? I've heard other people complain about the judgment they feel at bike shops, where you exchange money for specialized knowledge that is associated with specific social worlds. I don't see things as this exclusive, because a lot of people I know participate in bike co-operatives, where they consciously create welcoming spaces to share bike knowledge. I'm pretty into repair and co-ops as part of my DIY approach to sustainability, and yet I haven't mastered bike repair. 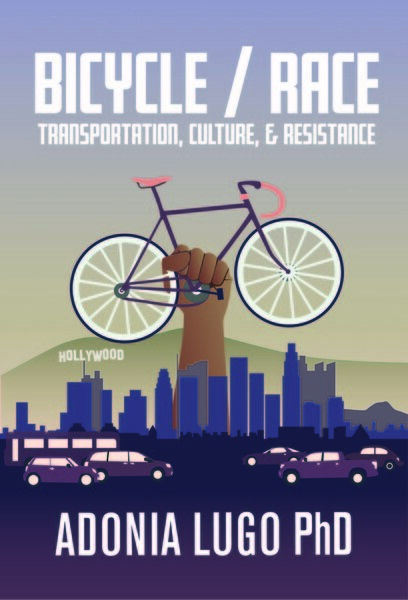 I think bike co-ops are freaking awesome, and an incredibly important part of the human infrastructure that makes biking possible in seemingly hostile cities like LA. However, I don't think everyone who rides a bike needs to know how to repair one. I wonder, for people who aren't into biking now is there a sense that you can't be a bicyclist without knowing how to build a bike from scratch? Is this another barrier to bicycling? In March, I heard Alison Graves of the Community Cycling Center comment on the subcultural status of bicycling, and how particular subcultures might not have a general appeal. Even in Portland, the quote unquote best bike city in the U.S., I know plenty of intelligent, conscientious people who don't see bicycling as something for them. The more we stretch the idea of what makes a bicyclist, the more room we make for different kinds of people on bikes. For me, biking is about the social experience of riding in shared urban spaces. It's about getting around, and feeling exhilarated. It's not about talking shop and gear so much. When I'm riding, my bike feels like a fluid extension of my body. Even after seven years of biking for transportation, this hasn't translated into a rabid curiosity about the mechanical life of my bicycle. Biking is such an embodied practice, and people have such different relationships with their bodies. We have different relationships with our bicycles, too. I'm probably going to keep learning about bike repair because it's a way to spend time with people I admire, but I'm going to stop judging myself about it. My rear tire has had a slow leak for even longer than the front one did. Will I get my hands dirty and get the satisfaction of fixing it myself, or will I contribute to a bike economy and pay someone else to fix it? Frankly neither choice sounds too bad.